Back again, Wilmer Calles on behalf of Rosa Calle still wants to go “backwards” to agricultural zoning and the neighbors don’t like it, on the agenda for tonight’s Greater Lowndes Planning Commission, after a split recommendation for tabling by GLPC a month ago, indication of many objections at the County Commission Work Session two weeks ago, and being tabled the next day at the County Commission Regular Session. Plus another county rezoning and two in Valdosta tonight. Request to rezone 13.6 acres from CON (Conservation) & R-10 (Suburban Density Residential) to E-A (Estate Agricultural). Request to update and amend a Planned Development. 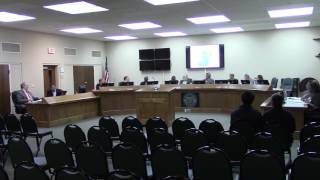 This entry was posted in GLPC, Government, Lowndes County Commission, Planning, Transparency, Valdosta City Council and tagged 2017-02-27, 27 February 207, Alexandria Street, Baytree Road, Conprehensive Plan, Crown Real Estate Development LLC, Georgia, GLPC, Government, Greater Lowndes Planning Commission, Gretchen Quarterman, John Sineath, LAKE, Lowndes Area Knowledge Exchange, Lowndes County, Lowndes County Commission, Moh'd Ahmash Moh'd Dar, Planning, Regular Session, REZ-2017-02, REZ-2017-03, rezoning, Rosa Calles, St. Augustine Road, Stewart Circle, Transparency, Turnerbrooks LLC, VA-2017-05, VA-2017-06, Val North Road, Valdosta, Valdosta City Council, Water, Wilmer Calles, zoning on February 27, 2017 by John S. Quarterman.